When I was in elementary school, my class was given an assignment to prepare a piece for an oral presentation. All the other students began memorizing poems, essays, excerpts from stories and books. Not me; I memorized my mother's recipe for bittersweet chocolate icing. The teacher conceded that in all her years of teaching, no one had ever memorized a recipe before, and I couldn't tell if this was a good thing or a bad thing, though I suspected she would have preferred a more literary approach to the assignment. My feeling was, if you had to memorize something, it might as well be something you really wanted to know. My mother didn't bake much, and when she did, it was usually a cake for someone's birthday. That cake was usually chocolate, but even if it wasn't, it was always covered in bittersweet chocolate frosting. It was, I think, just about the only chocolate thing I ate as a child. I learned to make it quite young, and memorizing the recipe seemed like a perfect idea. If only I could still remember it! I remember other things I had to memorize, things like my ghastly 7th grade music teacher's definitions of music and art, but not the icing recipe. I've been wracking my brains and searching old cookbooks hoping to find it. I finally decided to make what I think is the recipe and hope for the best. Of course I needed a cake to put it on. This cake recipe is one of the first things that came to mind when I started writing this blog, but I feared that everyone who had been vegan at least two weeks, already knew about it. It probably appears in some form on just about every vegan and vegetarian blog there is, as well as tons of regular baking blogs and cookbooks. 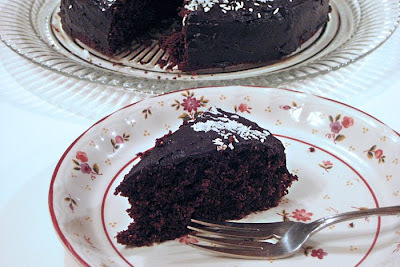 The vegans usually call it "vegan chocolate cake," and the omnivores refer to it by its traditional name, "wacky cake." It's said to come from the Great Depression when butter, milk and eggs were scarce, as it contains none of those things. The ingredients vary a little — sometimes 3/4 of a cup of sugar, sometimes 1 cup. Sometimes there's six tablespoons of oil, sometimes, five. And so on. It's sometimes baked square and sometimes round, and is usually topped with powdered sugar. When I initially came across the recipe, I passed it over, thinking it couldn't be good with such spare ingredients. I didn't want to bake a cake that tasted vegan, if you know what I mean. I first ate the cake as a guest in my husband's cousin's home, and didn't know it was the wacky cake. It was so good I asked for the recipe, and was surprised to see it was the very same cake. For a while I used non-dairy milk instead of water, but eventually decided the cake actually tasted better with water. I usually make it as an eight inch round or square, split the cake with a large serrated knife and put jam or frosting between the layers and on the top and sides. If I'm making it for a larger crowd, I'll make two recipes, and use two full layers to assemble the cake. It also works well as cupcakes. One of the great things about this cake is I always have the ingredients — there's nothing weird or hard to find. It's chocolatey and moist, tastes great, takes little effort and it always works! And even the non-vegans like it. What more can you ask from a cake? So, for all of you who have only been vegan for ONE week, or are thinking of being vegan if only you knew a good chocolate cake recipe, this is for you. Make three wells and add the vanilla to one, the vinegar to one and the oil to one. Pour the water over all and mix well. Let the cake cool in the pan at least five minutes before removing to cool on a rack. Slowly add the milk, a little at a time, and whisk to a smooth consistency. Heat to a very slow boil, stirring CONSTANTLY, reaching into the corners of the pot. This will burn and stick if you look away for a second. Turn the heat down and continue cooking and stirring until thick but still creamy, about five minutes. Turn off the heat and add the margarine and vanilla. Stir to mix in the melted margarine. Use a large serrated bread knife to carefully cut through the cake to split it into two layers. It's easiest if you cut into the cake a few inches then turn it and cut some more. Keep turning and cutting, gradually working towards the center. Turning and cutting the cake helps you keep the layers even. Use a large spatula to transfer the top of the cake to a large flat plate. Spread thick, all-fruit jam (raspberry or orange marmalade are nice) on the bottom layer. Use the spatula to place the top layer onto the bottom one. Wacky cake really is a pleasant surprise isn't it? Yours looks like it turned out perfect! I've been vegan for 3 months and I haven't tried this recipe. I am excited to make it!!! I really appreciate that you shared the recipe. Yes! After all the years I spent grinding flax seeds and blending tofu to make dairy-free cakes, (and some of them were very good! )it's great to know there's a simple solution I can turn to when short on time or energy for baking more complicated desserts. It's not the only cake I bake, but it really does come in handy. I don't think I tried this recipe until I'd been vegan for about 20 years! You're ahead of me. I hope you like it! I love that frosting! What a laugh that you memorized the recipe (definitely something I would have done, too). And as to the cake, why mess with a good thing? Wacky cake always fools omnis! I love bittersweet chocolate and I love frosting made with cocoa. What a great recipe! I can't understand why it tastes so good, but it does! The more bitter the chocolate, the more I like it. My wife made this cake today for our son's birthday, and I was not too excited about the prospect of another typical boring chocolate cake. 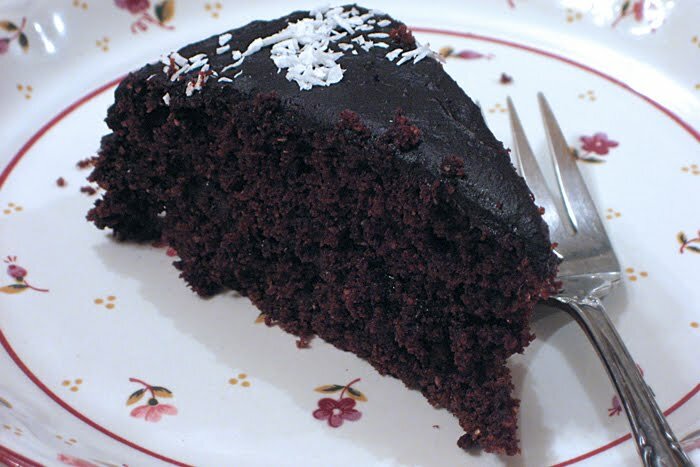 Mind you, I LOVE chocolate, but most chocolate cakes are somewhat wimpy: weak in chocolate flavor, spongy or bouncy with no real substance, etc. Now THIS one, on the other hand, is a REAL CAKE!!! In my 59 trips around the sun, I have only had a handful of cakes I really loved, and this one is now the absolute TOPS. 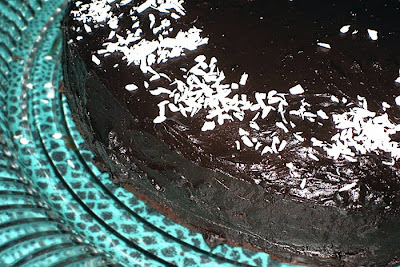 About the only things my wife changed were to add some 70% cacao Green and Blacks chocolate bar to the frosting; to add a layer of coconut frosting made from pure organic coconut cream between the layers; and use one layer of freshly ground whole spelt and the other of freshly ground whole white wheat for the cake itself. THANK YOU, DEAR BAKER, FOR SHARING YOUR SUPERB RECIPE WITH ALL OF US!!! Whoa. Thank you for sharing such enthusiasm! I'm so glad you liked this humble, but classic cake. I'm sure your wife's additions added greatly to the cake's success - coconut frosting between the layers is a great idea (sometimes I create a fresh raspberry filling) and adding extra dark chocolate is never a bad plan. I've never had a cake make with fresh milled flour but it must be superb.